Let them see you cleaning up. Children value the actions of adults, they mimic what we do in their play, and they internalize our behaviors. Even though they don't sit and watch us as we clean, they do notice when we do it. This is why it's important to make sure that we clean up the messes that we make and that we help the children clean up their messes. At clean up time, I always pitch in. I want my students to know that we all have to work together, and that includes me. This is also really helpful when a child says "but I didn't make that mess" because I can respond "I didn't either, but I'm still helping to clean it up." Make clean up a part of the routine. Making messes is fine, it should be a part of your day, but cleaning up those same messes should also be a regular part of your day. 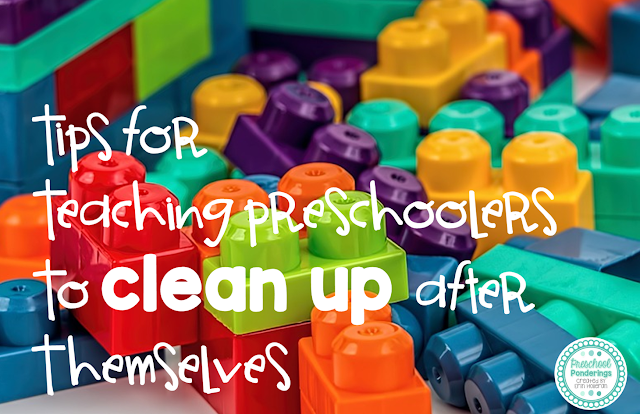 When clean up is routine children learn to expect it. The key to being successful in making cleaning up a part of your routine is to know your class and your schedule. Clean up should fall at natural times throughout the day. For example, if you've been painting on the same table that you're going to eat lunch on, then you'll have to clean off the table before you eat lunch. Similarly, if you need to put cots out for nap time, then you'll need to clean up whatever is on the floor first. These are all natural, authentic reasons to clean up, and these are the kinds of things that make sense to children because they are easy to explain. Give a warning. Warnings before clean up time are necessary. End of sentence, period. Think about it this way, imagine you are in the middle of one of your favorite things to do - for me that would be baking cookies - and someone comes over and say that you have to stop right where you are and put things away. If Im making cookies, I can't just stop. There's a process, steps that need to be completed in a specific order, or else all of the ingredients are wasted. This is exactly what it feels like when we tell children to clean up without giving them a warning that clean up time is coming. These three tips have completely made a difference in the way that clean up time goes in my classroom. I follow each of them every single time we need to clean up, and the children have learned that they can expect them, which makes clean up even more routine. What are your favorite clean up time tips?